Extra pockets for even more hands-free use! The folks over at Detailer's Helper have already revolutionized the detailing world by bringing us their original Detailer's Helper Premium Auto Detailing Belt. But now they've done it again – the new Detailer's Helper Heavy Duty Auto Detailing Belt includes all of the features you loved from the original belt, plus new time saving extras you didn't know you were missing until now. 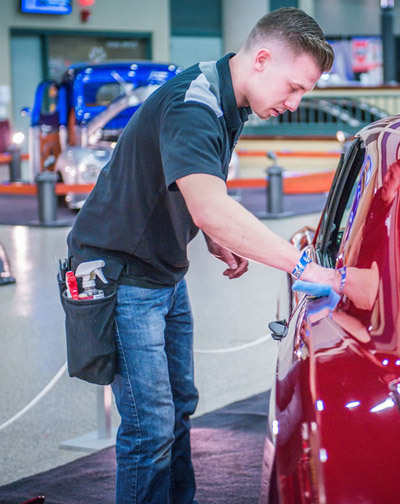 Doctors have nurses to hand them everything they need to get the job done, and now detailers have Detailer's Helper HD Auto Detailing Belt – the next best thing! From the tons of customer feedback that we've heard about the Detailer's Helper Premium Auto Detailing Belt, some of the best features are the ability to rearrange the pockets any way you'd like, as well as the soft cotton finish that does not mar paint. Well rest assured that each of these favorites have been rolled over to the Detailer's Helper HD Auto Detailing Belt. 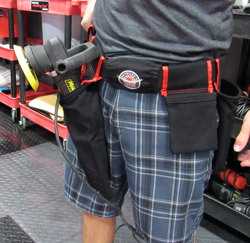 Detailer's Helper HD Auto Detailing Belt makes for ultra convenience while detailing. Not only does this belt boast 5 individual pockets, but now it also includes an extra-long, reinforced pocket especially for your polisher. Having pockets for all of your detailing product bottles and towels is great, but what happens when you need to set your polisher down in the middle of a detail? You certainly aren't going to rest it on the paint, and walking over to the nearest table or bench just wastes more time. 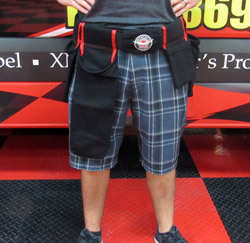 The Detailer's Helper HD Auto Detailing Belt rectifies this by providing the polisher bag, attached to your belt. The bag that holds your polisher is designed to fit most polishers on the market, allowing you a more hands-free experience. When you need to break from polishing for a moment, simply store your machine at your waist until you are ready to use it again. Reinforced deep polisher bag for quick machine storage during details. A 16 oz bottle bag. A 32 oz. bottle bag. A bag for your mobile phone or business cards. A large miscellaneous item/ polishing pad bag. Soft cotton fabric makes the Detailer's Helper HD Auto Detailing Belt safe around paint and machine washable. Detailer's Helper HD Auto Detailing Belt comes with the new Detailer's Helper logo, as well as red trimmed bags to you set you apart from other professional detailers. Keep all of your essential detailing tools and products close to hand during a detail with Detailer's Helper HD Auto Detailing Belt. The belt's numerous pockets hold everything you need. The polisher pocket will hold even the largest polisher you have.